Others view it as an elegant and cost-effective solution for many other design challenges. MENTOR have previously offered 2000µm and 1000µm flexible light guides made from black-coated PMMA. 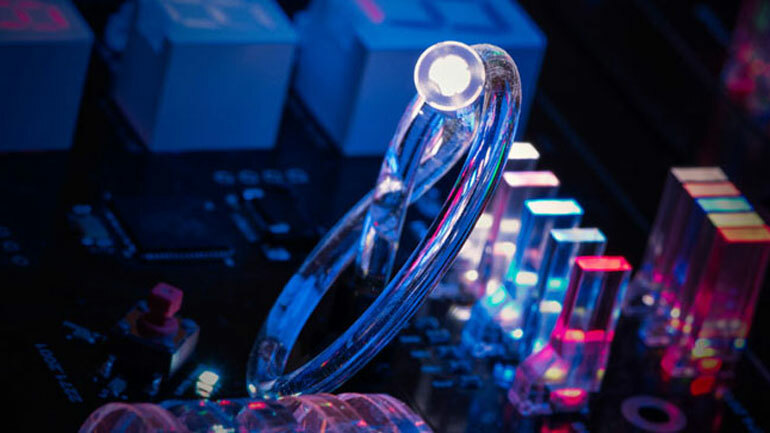 This new 3000µm version has the advantages of being considerably brighter and, since it is made from PU, far more flexible – you can literally tie it in a knot and the light still shines through! Designed for use with SMD TOPLEDS, the light guide is fitted into a Polycarbonate housing which is held in place on the PCB with two press-in lugs. As standard, a transparent lens is supplied for use at the visible end. Alternative colour lenses are also available as are custom lengths. MOQ for the standard part is just 1 pc. Please click the thumbnail below left to see a video of a functioning MENTOR flexible light guide. More MENTOR standard and custom solutions can be seen at Multitron’s main website.